Introducing DaGeDar... The Ultimate Collectable Racing Game! 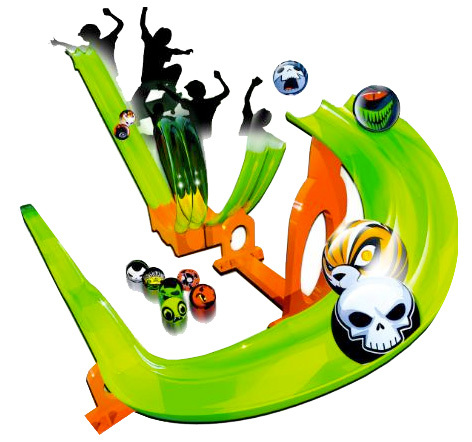 Launched in 2011, DaGeDar racing marbles from Cepia, (the inventors of Zhu Zhu Pets) hit playgrounds all over the UK. Said to be characters from the 33rd dimension, DaGeDar are super-cool, turbo-charged balls that have a mind of their own. With stunning graphics that reflect the power hidden inside of them, these balls practically demand to be raced hard! Designed for children aged 5 and over, DaGeDar demands a variety of skills including speed, strategy and agility. You can race your marbles around various tracks and loops to knock your opponents off... but make sure you control the speed and velocity of the balls or they could hurtle off! If you're really clever you can perform stunts and tricks by using spinners or carrying cases to release several balls at once for chaotic and totally unpredictable fun! Each DaGeDar ball features a different character and a different collector number too. You can register your collection online through the DaGeDar website. With over 240 different designs planned for release, make sure you keep an eye open for the mystery 33 number hidden on a few of them - these are the elite DaGeDar and have special powers! Collectability is everywhere with products like Morbs, Moshi Monsters and Zoobles leading the field. DaGeDar continues this trend for collectability as kids will be keen to swap duplicates with their friends and build up the most impressive collection they can. "From the moment you pick up a DaGeDar you know it's something different," said Russ Hornsby, the CEO of Cepia LLC. "This simple racing game combines the play patterns of competition, suspense and strategic skill that young boys love – all with an extensive variety of unique spirited characters that will captivate their imaginations for hours of fun racing."